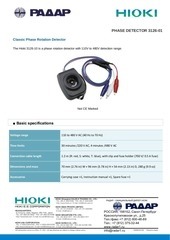 HIOKI 3126 01 ENG PHASE DETECTOR 3126-01 Classic Phase Rotation Detector The Hioki 3126-10 is a phase rotation detector with 110V to 480V detection range. 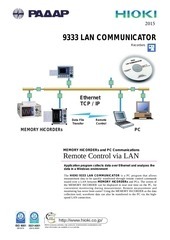 HIOKI 9333 ENG 2015 9333 LAN COMMUNICATOR Recorders Ethernet TCP / IP Data File Transfer Remote Control PC MEMORY HiCORDERs MEMORY HiCORDERs and PC Communications Remote Control via LAN Application program collects data over Ethernet and analyzes the data in a Windows environment The HIOKI 9333 LAN COMMUNICATOR is a PC program that allows measurement data to be quickly transferred through remote control commands issued over a LAN between MEMORY HiCORDERs and PCs. 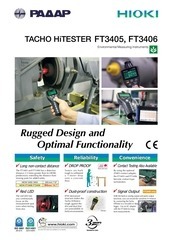 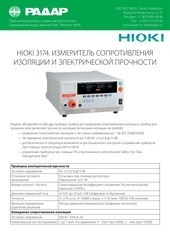 HIOKI FT3405 ENG TACHO HiTESTER FT3405, FT3406 Environmental Measuring Instruments Rugged Design and Optimal Functionality Safety Reliability ✔ Long non-contact distance ✔ DROP PROOF The FT3405 and FT3406 has a detection distance 2.5 times greater than its HIOKI predecessor, extending the distance from moving parts for added safety. 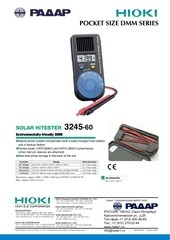 HIOKI 3245 60 ENG POCKET SIZE DMM SERIES SOLAR HiTESTER Environmentally-friendly DMM 3245-60 lHybrid power system incorporates both a solar-charged main battery and a backup battery lPocket-sized, CATIII (600V) and CATIV (300V) conformance (when test pin sleeves are attached) lNeat test probe storage in the back of the unit Function DC Voltage AC Voltage Resistance Continuity Range 420.0 mV/ 4.200 V/ 42.00 V/ 420.0 V/ 600 V 4.200 V/ 42.00 V/ 420.0 V/ 600 V 420.0 W/ 4.200 kW/ 42.00 kW/ 420.0 kW/ 4.200 MW/ 42.00 MW 420.0 W *Buzzer sounds at approx 50W± 40W or less Best Accuracy ±1.3 %rdg. 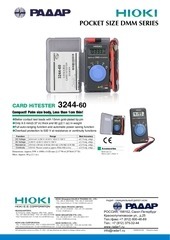 HIOKI 3244 60 ENG POCKET SIZE DMM SERIES CARD HiTESTER 3244-60 Compact! 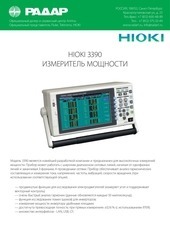 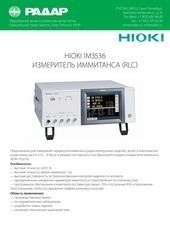 HIOKI IM3536 RUS Официальный дилер и сервисный центр Anritsu Официальный представитель Fluke, Tektronix, HIOKI РОССИЯ, 198152, Санкт-Петербург, Краснопутиловская ул., д.
HIOKI IM7580 RUS Официальный дилер и сервисный центр Anritsu Официальный представитель Fluke, Tektronix, HIOKI РОССИЯ, 198152, Санкт-Петербург, Краснопутиловская ул., д.
HIOKI 8860 50 RUS Официальный дилер и сервисный центр Anritsu Официальный представитель Fluke, Tektronix, HIOKI РОССИЯ, 198152, Санкт-Петербург, Краснопутиловская ул., д.
HIOKI 3255 50 ENG 3255-50 D I G I TA L H i T E S T E R Field measuring instruments Combine with CLAMP ON PROBE for AC current measurement Combine with CLAMP ON PROBE for AC current measurement Actual-size http://www.hioki.co.jp/ CAT III 600V CAT II 1000V HIOKI company overview, new products, environmental considerations and other information are available on our website. 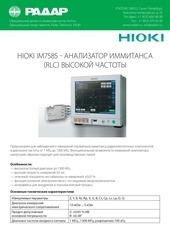 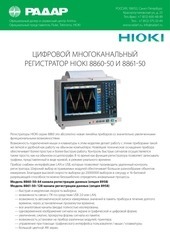 HIOKI IM7585 RUS Официальный дилер и сервисный центр Anritsu Официальный представитель Fluke, Tektronix, HIOKI РОССИЯ, 198152, Санкт-Петербург, Краснопутиловская ул., д.
HIOKI DT4281 RUS Официальный дилер и сервисный центр Anritsu Официальный представитель Fluke, Tektronix, HIOKI РОССИЯ, 198152, Санкт-Петербург, Краснопутиловская ул., д.
HIOKI UA1780 ENG FIT-LINE INSPECTION DATA CREATION SYSTEM UA1780 Automatic Testing Equipment In Circuit Tester 90% 90% reduction reduction in in data data creation creation time time More More than than 93% 93% reduction reduction in in line line downtime downtime Data is created based on Gerber data and mount data* 1 while referencing component library information. 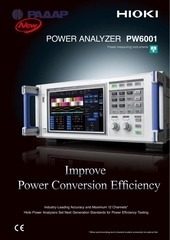 HIOKI PW6001 ENG POWER ANALYZER PW6001 Power measuring instruments Improve Power Conversion Efficiency Industry-Leading Accuracy and Maximum 12 Channels* Hioki Power Analyzers Set Next Generation Standards for Power Efficiency Testing * When synchronizing two 6-channel models connected via optical link 2 Basic accuracy for power ±0.02% * Achieving true power analysis High accuracy, wideband, and high stability. 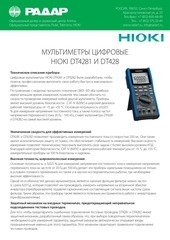 HIOKI 3174 RUS Официальный дилер и сервисный центр Anritsu Официальный представитель Fluke, Tektronix, HIOKI РОССИЯ, 198152, Санкт-Петербург, Краснопутиловская ул., д.
HIOKI 3390 RUS Официальный дилер и сервисный центр Anritsu Официальный представитель Fluke, Tektronix, HIOKI РОССИЯ, 198152, Санкт-Петербург, Краснопутиловская ул., д.
HIOKI LR5001 ENG DATA LOGGER LR5000 Series Data Loggers Complete Line of Easy-to-Use Compact Loggers with Expanded Memory The new HIOKI compact data logger series easily records temperature, voltage, current, and instrumentation signals over long periods. 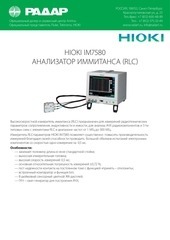 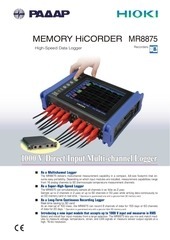 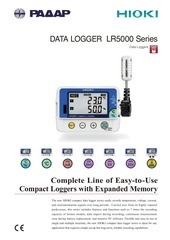 HIOKI MR8875 ENG MEMORY HiCORDER MR8875 High-Speed Data Logger Recorders 1000 V Direct Input Multi-channel Logger n	As a Multichannel Logger The MR8875 delivers multichannel measurement capability in a compact, A4-size footprint that ensures easy portability. 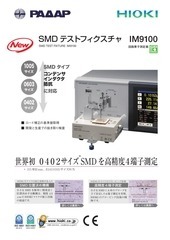 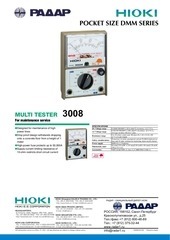 HIOKI SF1001 ENG SF1001 Instruction Manual POWER LOGGER VIEWER EN May 2015 Revised edition 3 SF1001A981-03 15-05H User's License Agreement Important Please read the following agreement carefully. 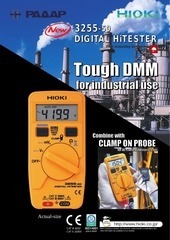 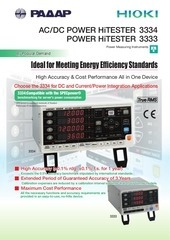 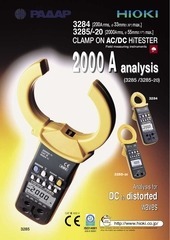 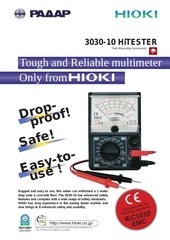 HIOKI 3030 10 ENG 3030-10 HiTESTER Field Measuring Instruments Tough and Reliable multimeter Only from p o r D roof! 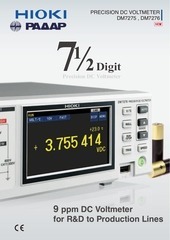 HIOKI DM7275 ENG PRECISION DC VOLTMETER DM7275 , DM7276 7½ Digit Precision DC Voltmeter 9 ppm DC Voltmeter for R&amp;D to Production Lines 2 High-Accuracy Measurement Approaching the Precision of Reference Instruments Outstanding Long-term Stability and Temperature Characteristics 1-year long-term guarantee for high accuracy equivalent to an 8-½ digit DMM A DC voltmeter boasting the long-term stability and ease of use that only Hioki’s field measuring expertise can deliver. 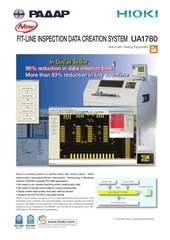 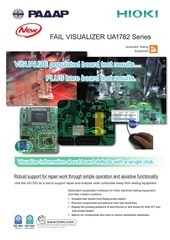 HIOKI UA1782 ENG FAIL VISUALIZER UA1782 Series Automatic Testing Equipment VISUALIZE populated board test results… ▲ PLUS bare board test results.